The Vancouver condo market followed a similar trend this month as seen in the November Condo Report. Condo sales across Vancouver West fell 29% year over year, and prices appear to be flatlining, after a slight drop off from peak prices back in June/July. It also followed a seasonal trend that saw the average days on market continue to creep upwards. With that being said, condos are still selling well. I’ll break down all the numbers below. Vancouver condo sales took a substantial step backwards compared to one year ago. Last year was certainly a record year, however, Vancouver condo sales for December were still 7% below the 10 year average. Vancouver West Average Days on Market. Vancouver condos are taking longer to sell. Some of this is seasonal, some accredited to a slowdown. The average days on market is still 17% lower than it was last year but up from quite a bit from it’s low of 17 days in August. Months of inventory indicates how many months of inventory we currently have given the pace of sales and new listing hitting the market. Inventory levels indicate it’s still a sellers market in all these areas. Although sales dropped off year over year, we still have record low inventory levels. Inventory levels are recovering from record sales earlier this year. Expect more inventory moving forward now that the holidays are over. 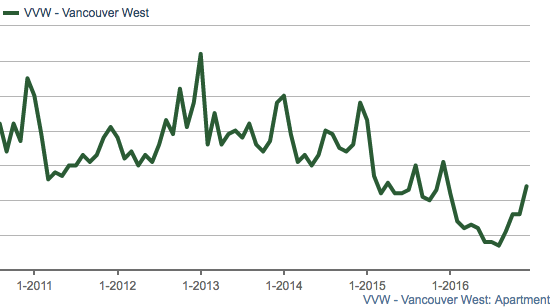 As per the MLS benchmark, Vancouver West condo prices are down 4.5% from it’s peak in July. This is roughly in line with what I am seeing from feet on the ground and look at past sales from June and July. I’m still comfortable saying Vancouver condo prices are down roughly 5% from peak prices. This holds true for all the areas mentioned in this post. It was still a relatively strong month for Vancouver condos. Despite a pretty big drop off in sales, which are now below the 10 year average. Inventory remains at record low levels. This is allowing Vancouver condos to sell relatively quickly (34 days). However, prime selling season is just around the corner so more listings are coming. Prices have corrected about 5% and list prices are now showing that. Multiple offers are rare, only 38/238, or 16% of listings were sold over asking price. There should be a little room for negotiation on most prices but you’ll have to act quickly as condos are still selling quickly, especially at the lower end (under $600,000).